The Big Berkey water filter system is made of a high grade polished 304 stainless steel. This provides an attractive, sanitary, and long lasting unit that fits perfectly in todays modern kitchen. One simply adds water into the upper chamber where the filters reside and allows time for the water to filter through and drop down in the clean water lower chamber. All our berkey systems come with 2 sets of black berkey elements that remove harmful pathogenic bacteria such as E-coli, Cholera, Giardia and Cryptosporidium. These elements also remove and reduce unwanted chemicals such as chlorine, heavy metals, rust, detergents, sediment, pesticides, herbicides, MTBE's, organic solvents, VOC's, THM's and foul tastes and/or odors. 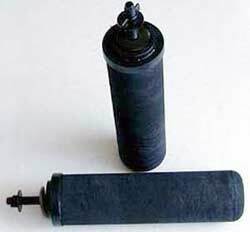 The durable and long lasting Black Berkey filtering elements can be cleaned (over 100 times) when needed with a soft brush or Scotchbrite pad druing their 6000 gallon usag period. The Big Berkey water filter utlizes the strength of the black berkey purifcation elements in the upper chamber. These filters target many chemicals and contaminants while leaving in the beneficial minerals your body needs from water. It's a basic concept that results in highly purified, clean, and great tasting water! Berkey water filters only take a few minutes to assemble and do not require tools, electricity, water pressure, or plumbing. They are extremely simple to understand, operate, and maintain. The cost of highly purified Big Berkey water only costs approx 2 cents per gallon. The simplistic design allows the user to easily remove and clean the black berkey filters over and over again if they ever get clogged up. Ordinary tap water is easily purified and no match for the Big Berkey water filter. However it even purifies raw and untreated water from rivers, lakes, and streams. Just as importantly, the Berkey performs beautifully in the unexpected event of an emergency or natural disaster. Blackouts, hurricanes, floods and earthquakes often result in tap water being unavailable and that's when the Berkey becomes ideal for taking untreated water and making it drnkable. The Big Berkey is very convenient and easy to use. The upper chamber nests into the lower chamber for portability allowing you can take it anywhere: going hunting, on vacation; on camping trips, in college dorms, and in your boat or RV. The Big Berkey water filter is made of durable, high-grade polished 304 stainless steel. Its high quality and attractive design make it a perfect addition to your kitchen and home. The Big Berkey Water Filter's effectiveness and high quality workmanship has stood the test of time. First ordered by the Royal House in England, it's also been used commonly by relief organizations such as the Peace Corps, Unicef, and Red Cross Societies internationally. 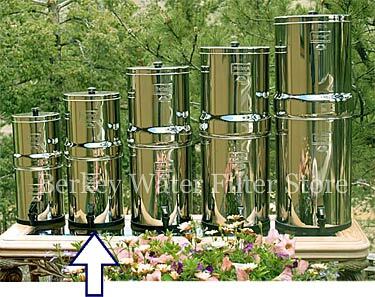 The Berkey filter systems have been used for over 150 years by explorers, missionaries, and relief workers in over 140 countries around the world.